Be the first to share your favorite memory, photo or story of Derrell. This memorial page is dedicated for family, friends and future generations to celebrate the life of their loved one. 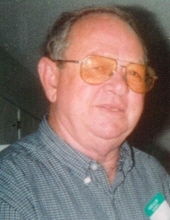 Derrell Rogers, 77, passed away Sunday, January 13, 2019 at Ogeechee Area Hospice Inpatient Center in Statesboro. He was born August 8, 1941 to Thomas” Buster” Hendrix and Juanita Kicklighter Rogers and lived here all of his life. He was retired from forestry at Ft. Stewart and was a farmer for many years. Derrell was an avid outdoorsman that loved to fish. He was a deacon and member of Beards Creek Primitive Baptist Church. He is preceded in death by his parents; wife, Mary Sikes Rogers; son, Tommy Rogers and a grandson, Josh Rogers. Six grandchildren, six great grandchildren, several nieces and nephews also survive. Visitation will be 5:00 until 7:00 pm, Tuesday, January 15, 2019 at Brannen-Kennedy Funeral Home. Funeral Services will be held 11:00 am, Wednesday, January 16, 2019 at Beards Creek Primitive Baptist Church. Burial will follow in Beards Creek Church Cemetery. To send flowers or a remembrance gift to the family of Derrell Rogers, please visit our Tribute Store. "Email Address" would like to share the life celebration of Derrell Rogers. Click on the "link" to go to share a favorite memory or leave a condolence message for the family.